Start/ Finish will be at the Forest Picnic Area. 8 am start for all distances. 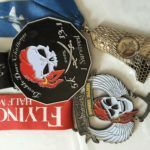 All finishers will receive Unique Custom Welded Finisher Medals. Trophies are given to top three male & female in each distance.